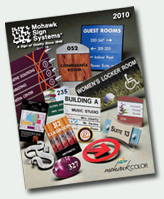 Since the early 90's Mohawk has been on the forefront of bringing you quality signage that complies with the American with Disabilities Act (ADA). Current guidelines are changing and Mohawk remains a resource you can count on. 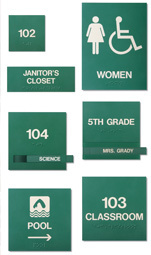 Looking for a green signage products with low environmental impacts? Mohawk Sign Systems, Inc. has been manufacturing architectural interior and exterior signage in the construction industry for over 60 years. 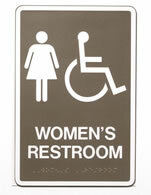 This long-term knowledge is key to producing ADA-compliant, high quality, complementary wayfinding systems. 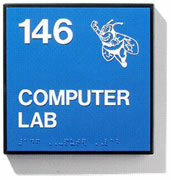 No other graphic process can produce a more durable, intrinsic sign than Mohawk’s Series 200A Sand Carved® process. 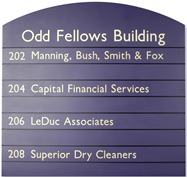 For this reason, Mohawk Sign Systems remains highly specified by architects, specifiers and interior designers for hospitals, schools, medical facilities, hotels, museums, and other public buildings across the United States. Mohawk takes pride in providing high quality products and personalized service while continuing to be an economically and environmentally friendly solution for all of your signage needs.